As the year draws to a close, my attention turns to the list of books I have read this year. I’ve been keeping track for the last three years, and I’m surprised at how much pleasure this small habit gives me. I only write down the books I have finished, which eliminates many books every year, nonfiction taking an especially big hit since I often read selections from nonfiction books instead of reading them from beginning to end. Re-reads count, as do beta reads for novelist friends. Short stories and novelettes do not count unless they are in a collection, but novellas sometimes do…if I remember to include them. Looking over my list for 2011 as of today, I’ve selected my ten favorite new-to-me reads thus far this year. It’s been a fantasy-heavy year for me, in stark contrast to my list of favorites of 2009, which was very science fiction-heavy. Maybe next year I can find more of a balance. I did read several YA dystopias this year, but upon reflection I am unable to include any of them on my “Best of” list this year. While some of them were entertaining, none of them hold up particularly well in my memory, and almost all of them suffer from some flaw or another that makes me hesitate to recommend them. I haven’t read all the recent YA dystopias that have received good buzz yet (I’ve heard good things about Blood Red Road and Legend, for example), so it’s my hope that I missed a few gems that I’ll catch up on next year. This is the sequel to If I Stay. It is told from the point of view of a young rock star who is trying to come to terms with his life and his decisions. The two main characters are both passionate about music, which possibly explains why I particularly like it. This is book 2 in the Curse Workers series, and it does not stand alone. I’ve been really enjoying this series; the world building is strong and the books have their own distinctive voice that make them both enjoyable and memorable. A romance set in a boarding school in Paris. The plot isn’t the strong point here, but the protag Anna’s voice is likeable, distinctive, and feels very very real. This is by far the best YA novel I read this year. The worldbuilding, voice, plot, characters: all of them worked for me. It reminds me a bit of old Robin McKinley a la The Blue Sword, but definitely tells a story all its own. The last two books of her trilogy, these books do (more or less) stand alone. This is epic fantasy written straight for my own personal taste. I think I particularly love these books because they are NOT set in Ye Olde Medieval Europe only sanitized; the setting feels real and true to itself, and the characters aren’t cookie cutters either. Plus I love the books’ cosmology so much, and I enjoyed the last book in particular, told from the POV of one of my favorite of her gods. You might have to be an SF/F fan to truly appreciate this book (although that being said, plenty of its references did not hit the mark with me). This book takes place after the big show-down of the plot, so can be seen as a novel-length denouement (although of course it is more than that) and it unfolds itself leisurely and with great character depth. The end didn’t work for me, but even so, it was one of my best reads of the year. I suppose this novel is technically science fiction, since it involves time travel, but it read more like fantasy to me. A spellbinding yarn that weaves in and out of itself in a few (to me, at least) unexpected ways, this historical fantasy/sf/whatever-it-is charmed me, especially in the sections involving the author H.G. Wells. It’s the worldbuilding of this novel that makes it stand out, set in modern South Africa exploring the consequences of one little addition of fantasy/magic to the world we know now. This novel moves at a furious clip, and occasionally the plot suffers from this, but it’s worth the read to be immersed in this fascinating world. What is most noteworthy about my reading year is that I discovered the beautiful prose of Guy Gavriel Kay. I have to be in a certain mood to read him, but when I am, there is absolutely nothing better. What books did you read this year that you particularly enjoyed? Please let me know so I can add them to my reading list! Ready Player One was fantastic. I also very much enjoyed “The Sleeping Partner” by Madeleine Robins and suspect it will appeal to you, based on your existing list. It’s an alt. history Regency with a main character who is a Fallen Woman and an Agent of Inquiry. Think of it as a mystery of manners. Ha, totally on the same page (yuk yuk) with you, Mary, re: Ready Player One! Oh excellent, I’ve added the Robins to my to-read list; sounds like just my thing! Oh Amy, the love I have for this entry!! I adored Where She Went, and If I Stay. There’s a groundedness to those books that I marvel at. Girls of Fire and Thorns is already on my list, yay! And I also loved Among Others and gave it to my Dad as my pick of the year. It just stuck with me. Great books all around! I also have a geeky crush on Ready Player One but I think that’s because it’s 80s, 80s, 80s. Oh Danielle, you’re in for a treat (I hope)! I think you’ll really like The Girl of Fire and Thorns. I really need to find some more sf to read next year, though. Maybe I’ll go back and read some older stuff. My reading might be a bit off from the audience here, but I’ll share anyway. I’ll cut it down to just my Top 5. 1) “What Hath God Wrought” by Daniel Walker Howe. Scary big at 900 pages, but it covers American History from 1815-1848 amazingly well. Pulitzer Prize winner and deservedly so. Currently reading but will be done before the end of the year and love it. Covers the events that spiraled into the Civil War. Another deserving Pulitzer winner. The events leading up to and the first month of World War I. History by a non-historian, but so well written it has aged amazingly well since its publication in the 1960s. The unintentional compare/contrast of WW1 and the Cuban Missile Crisis (it was published earlier that same year) is pretty fascinating. Another deserving Pulitzer. I’ve read very few Pulitzer winners and didn’t intend to read 3 in one year, but they are all so good I may start reading them intentionally. Dual biography of Pat Garrett and Billy The Kid. About 300 pages, but a real good balanced book that shows what the Wild West was like. Famous big winner on Jeopardy, Jennings is a map nerd and dives into the modern day world of all things geography – from geography bees to geocaching. I’m a map nerd too so I ate it up. Well, I don’t know what everyone else here likes to read (although I’d like to!) but personally I’m fascinated by history, so these sound great to me. I’m particularly intrigued by “The Impending Crisis” since I’m a closet early Civil War nut. I really need to come up with a better way of tracking the nonfiction I read…probably something altogether separate from my fiction tracking. As it is, I have no record of the books to which I have referred since I didn’t read every chapter of them, and yet having a record would be so useful. Although I guess it helps that most of them I end up owning… I have such a book habit! 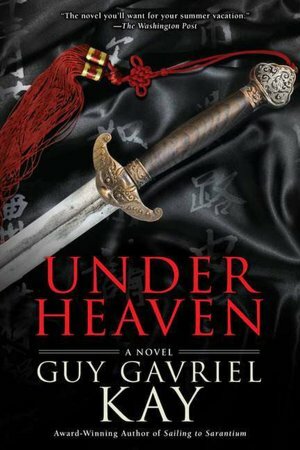 Under Heaven was on my list this year too. I love Guy Gavriel Kay. If you are new to his fiction, I recommend Tigana and Last Light of the Sun. Also, Ysabel is great. In YA, I liked “all these things i’ve done” by Gabrielle Zevin. I’m so glad to hear that you liked “All These Things I’ve Done.” It’s been on my list for a while now, but I’ve been holding off. Now that I have a personal recommendation though, I think I’ll splurge and get it!